Ugh, Is This the Start of Roger Clemens Comeback Chatter? 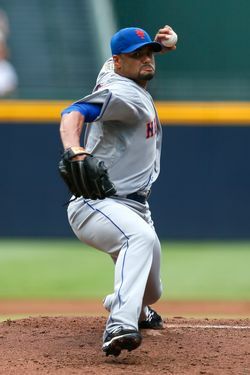 Entirely because of that no-hitter you may vaguely remember, 2012 will be thought of as a successful year for Johan Santana. After missing all of last year (a season in which the Mets paid him $21.6 million), Santana recovered to be the opening day starter for this Mets team, which is a feat in and of itself. It's all probably over now. Santana is missing his scheduled Thursday start to receive another MRI, and it's looking increasingly likely that the Mets will just shut him down. Which gives us a moment to see exactly what the Mets paid for this year. The Mets gave Santana $24 million for his 2012 performance, and here's what they got: The worst year of Santana's career. Now, because of the no-hitter, that's hard to wrap one's mind around, but since that no-hitter, Santana has been awful. His ERA since then is a shocking 7.79. The no-hitter (and the 2.38 ERA he had after the game) has disguised it, but Santana was pretty lousy this year. Was it the 134 pitches the threw in that game? Maybe, we'll never know. But the Mets gave Santana $24 million — and will be giving him $25.5 million next season — and this is what they got out of it. We hope they sold a lot of no-hitter T-shirts.